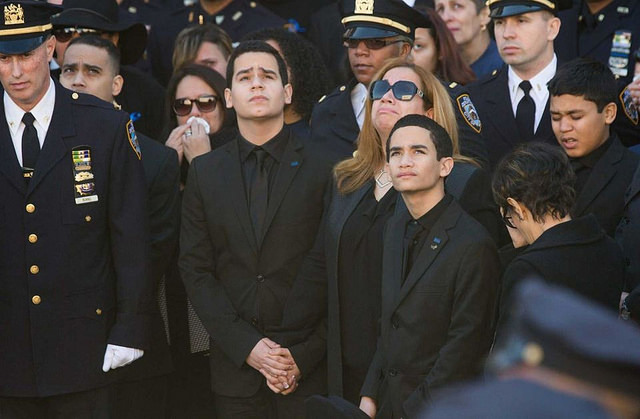 On Saturday thousands of mourners came to pay their last respects to Rafael Ramos, one of last week’s two murdered NYPD police officers. The funeral took place at the Christ Tabernacle Church for the 40-year-old married father of two. New York City Mayor Bill de Blasio, who has been censured by the police department for his comments about the way law enforcement has been treating blacks, eulogized Ramos. “An attack on the New York Police Department is an attack on all of us. It’s an attack on our system of justice. We are a nation of laws. 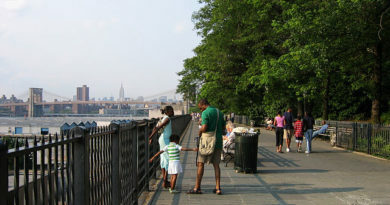 We are a state of laws” de Blasio said. To show their distrust and anger with previous remarks made by the mayor, many of the police officers in attendance turned their backs on him when he took to the podium. De Blasio had remarked a few weeks ago that he was fearful about how police might treat his own son, who is bi-racial. In addition to much of the NYPD, there were officers from all over the country at the funeral, all wearing blue uniforms and white gloves. The thousands were crowded into the streets surrounding the church, watching the speakers on big screens peppered throughout the area. “Thousands upon thousands upon thousands of American families stand and wait so their husbands and wives, fathers and sons can serve the rest of us. Police officers and police families are a different breed. Thank God for them” Biden said.